Is it just a coincidence that virtually all the world’s current conflicts finds its roots to either British divide or rule policies or the policies of other European colonial rulers! Sudan’s case is no different. It is time people woke up to realities. The handful of nations being used as the big bullies in a new wave of military interventions on the pretext of solving conflicts devise their plans irrespective of religion, ethnicity, race but solely on realizing profit through plunder. Leaders and their stooges are mere puppets in a game that today is being carved out by an invisible set of people which is why Gen. Wesley Clarke said in 2001 that 7 countries were earmarked to be taken out in 5 years ” Iraq, Libya, Syria, North Korea, Lebanon were on that list. So was Sudan. Should we be surprised that in 2011 Sudan was divided and made into 2 separate states? The plans to divide, militarily intervene, separate are all planned and politicians only help execute this plan. South Sudan was separated purposely by the British depriving the South of economic and social development. British chose to invest in Arab North over Christian South Sudan. The North was more developed and more populated. To make matters worse with the intent of subverting Islam from within, Britain deliberately created the Wahhabi movement in the North while Christian missionaries were used to ensure Islam did not trickle to the South. The British is said to have planned to attach South Sudan (Christian) to British Colonial East Africa as well. Another policy adopted by the British was ‘indirect rule’ in other words in order to deny educated and urban class Sudanese from influencing social and political life Britain gave power to the tribal leaders dividing the South into hundreds of chiefdoms that were to function separately resulting in Northern officials transferred out from the South, trading permits withdrawn to the Northerners and speaking Arabic and wearing Arabic dresses discouraged (Ref Southern Policy Document). This Southern Policy was reversed in 1946 with British now saying that the Sudanese were ‘inextricably bound, both geographically and economically to the Arab north’. This was a total shift of Britains earlier policy many say was simply to repay North Sudan for helping Britain during World War 2. Policies can change but when policies that ingrain hatred between people living in the North against those in the South in a systematically devised program is it as easy to change? Britain had drilled into the minds of the Sudanese that the North was different from the South and vice versa and the built up of this difference culminated into a large scale armed conflict in the mid-1950s. The armed conflict in Sudan cannot be any different to the background to what materialized in Sri Lanka. It is on this ground that any contemporary conflict intending to find the root to the conflict cannot omit from investigation the colonial policies that led to the animosities that prevail. It should not be too difficult to read between the lines of every policy adopted by the British and other colonial rulers. Fast forward post-independence virtually all these former colonies are experiencing turmoil that were genetically engineered by the British through Christian missionary education and the social system they fostered. In fact, the similarity was such that the army mutiny in South Sudan can be compared to the Catholic Action and the army attempted coup by Christian officers to overthrow the Sirimavo Bandaranaike Government in Sri Lanka. The British withdrew Sudan after occupying it since 1899 when it was certain a power struggle would ensue in Sudan. This was when Britain decided to offer independence to Sudan in 1956. Ironically, it was the Christian South that was segregated by the British in Sudan while it was the Sinhalese Buddhists that became the target in Sri Lanka. If the South did not wish to participate in the Sudanese Government post-independence, Northerners in Sri Lanka echoed the same in Sri Lanka. This was done by importing a Christian convert to start a Tamil Only state. Though Arab-dominated North Sudan was economically far more developed than the South, this was not the case in Sri Lanka. With English education through Christian missionaries made available to minorities and a handful of elite Sinhala families willing to work to the dictates of the British, it was they who held jobs and had the power of purchase though numerically the Sinhalese Buddhists were more, their comforts in comparison was meagre. West’s interest in Sudan is OIL. 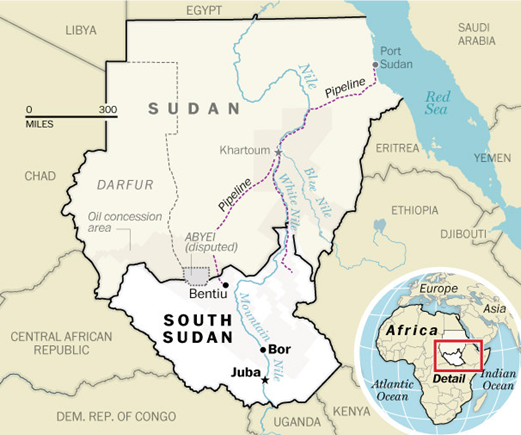 Sudan is said to have oil reserves rivaling those of Saudi Arabia as well as natural gas and is one of the worlds 3 largest deposits of high-purity uranium and 4th largest deposits of copper. To tap into this the roundabout way was to sponsor separatist movements in South Sudan in a bid to force peace agreement that set off plan B ” Darfur (in West Sudan) where US pretends to act as mediator while underhand getting its closest African allies to help train SLA and JEM rebels. Then US gets its media to promote atrocities committed by Sudan’s Central Government and Jan jawid militias and described as an “Arab’ onslaught against ‘African’ people. All Lies because all Arabs and all Africans are indigenous and equally all are BLACK, all are MUSLIM and all are local and all are Sunni Muslims. But that doesn’t sell over international media so a spin is needed. The crisis in Darfur was about scarcity of water for agriculture in view of the drought. Darfur has 35 tribes and ethnic groups. There are over 400 ethnic groups in whole of Sudan. People died in Sudan from preventable and treatable diseases because of 19 US cruise missile attacks ordered by Bill Clinton on 20 Aug 1998 at the El Shifa pharmaceutical plant in Khartoum which provided 60% of medicine in Sudan. The medical facility was not rebuilt or compensation given. The Lies about Darfur led to 7000 African Union troops in Darfur backed by US and NATO, thousands of UN personnel are supposedly overseeing refugee camps for those dislocated by drought, famine and war ” their function is not to provide food. They are paid to destabalize Sudan further. Sri Lankan Tamils please note the dangers of continuously seeking foreign intervention. Look at Darfur ” North Sri Lanka will get the same treatment. None of the UN humanitarian missions after endorsing resolutions have been humanitarian. Sri Lankan Tamils must note that the US troops carrying UN flags invaded Korea in 1950 and that led to 4million deaths. The same UN flag prevails and US has occupied and divided the Korean peninsula and incidentally the UN Chief is South Korean! UN troops were also deployed in the Congo in 1961 and the tragic fate that befell Patrice Lumumba haunts us still as well as the death of Dag Hammerskjold former UN Secretary General who did not belong to the imperial system. US pushed a UN mandate in 1991 bombing Iraqi civilian infrastructure including water purification plants, irrigation and food processing plants starving Iraqis through sanctions. US also got UN to send troops to Yugoslavia and Haiti which is a cover up for US and EU intervention and occupation. Peace and Reconciliation has been made into a joke by these Western nations. Going centuries back US and EU imperialism is what generated the genocidal slave trade that crippled Africa, uprooted the indigenous population of America and 3 quarters of the world was looted by these colonial powers. Now they are returning for a second round of looting via military interventions based on concocted lies that are being authorized via the UN. In the case of Sri Lanka the ‘something must be done to stop the carnage’ that worked in Sudan did not work in Sri Lanka for the Government crushed the LTTE. All that they are left to do is go by the bogus civilian figures which are all past news and nothing in the present to entail a foreign presence in Sri Lanka, so the next option would be to place a UN mission to study what happened in the last 4 months ” but these are all in the past. People are going on with their lives. What is making the situation bizarre is when the Tamil politicians who are well aware of inviting the angels of the West and UN to Sri Lanka is likely to place the people of this country in a precarious position no different to how the people of Sudan, Libya, Iraq, Afghanistan, Haiti are all sufferung. From 1983 until 2005, the war in southern and central Sudan left more than two million people dead and drove some 4.5 million civilians from their homes. From 2003 to the present, the war in Darfur has killed at least 200,000 (possibly up to 400,000) people and driven more than 2.5 million people from their homes. The Sudan Caucus, in partnership with their new Save Darfur allies, also secured over $6 billion in humanitarian aid, between 2005 and 2010, to the war-affected areas in Sudan. Incidentally those that were calling for intervention in Sudan were the Christian Evangelicals and the Zionists. When the New York Times says ‘Out of Iraq-Into Darfur’ it has to mean something…. The headlines often are the giveaways… just like a recent editorial in Sri Lanka advised Sri Lanka to ‘join us and we’ll drop the charges’ ” Gaddafi took this option but he ended up being killed and Libya is in total disarray. South Sudan is today an independent Christian nation. Its literacy rate is just 27% and it is one of the poorest countries in the world. All is not rosy in that new state either. Emergency has been declared. Media says the people are ‘begging’ for UN intervention. That ‘begging’ has to be surely what was planned by those who helped create the outbreak of violence for the rebels across Sudan are all funded by Western sources through African allies. Independent South Sudan of Black Christians will soon be another Western base just like Kosovo. Those planning the new Christian state would ensure the existing Christians would be busy fighting each other while the plunder of Sudan will continue unabated. 3million are said to have voted in South Sudan at the independence referendum. The LTTE-proxy, the TNA walked away with close to 80% of the votes at the Provincial Elections in Sri Lanka. Tamils may like to let us know if they voted because the TNA were Tamil and ‘our people’ or they too espoused for a separate Tamil state. While South Sudanese do not live or possibly are welcome in North Sudan, in Sri Lanka’s case most of the Tamils are living in the South amongst the Sinhalese. The separate North is simply an ‘achievement’ score card simply to say we got what we wanted but in practical terms Tamils are well aware that they have no such grievances to validate their demand which is why they resort to political rhetoric and false propaganda. When challenged they cannot produce a single piece of evidence that shows legislative, constitutional state policy exclusively denying Tamils rights that only Sinhalese and others enjoy. A grievance can become taken up at international level only if rights are exclusively denied through state policy ” Tamils have no such example to give. Whereas the ‘no Sinhalization’ of North is a direct grievance and should be taken up, for a province cannot deny the right of a citizen of Sri Lanka to live anywhere he so chooses. Hindu Tamils have been taken for a ride by the Christian bodies that play the angel on behalf of the aggrieved Tamils against the Sinhalese. It is a plan to make a Christian Eelam that would then reach out to eventually create of India what they did to Yugoslavia ” an India divided into numerous ‘independent’ states all under Western influence but all waging some war/conflict with each other. Surely, the Tamils should be intelligent enough to take the examples that are piling before them and decide to address the real danger for the entire country and the entire populace. In the context of similarities between Sudan and Sri Lanka what Sri Lanka and in particular the Sri Lankan Tamils espousing for a separate state under whatever name they like to Christian it, should now watch how Sudan is falling apart in particular the region that was said to enjoy complete autonomy, liberation and freedom. None of that is happening today in South Sudan. Its leaders fell for traps no different to the manner Gaddafi fell for the ‘just do what we say and you will be OK’ option resulting in his murder and the complete disintegration of Libya. Groups of people around Sri Lanka’s leaders are peddling this option too. That option if taken would only put into advance mode and seal their fate whilst totally destroy a 2500 ancient civilization as well. Let Sri Lanka’s leaders not take that option and for leaders who showed mettle in taking on the diplomatic offensive during the heat of the war we are a little perturbed why the lion in them seems to have suddenly disappeared. The lion must prevail in Sri Lanka. “Sri Lankan Tamils”?? There are no Sri Lankan tamils? There are tamilnadians living in Sri Lanka and they have Sri Lanka’s citizenship. But has to accept that tamil nadians either came illegally or brought by imperialists or imperialists allowed them to come to Sri Lanka from tamil homeland, tamil nadu of south india. Those tamil nadians though they have Sri Lanka citizenship but they are alien community and mentally they live in tamil homeland tamil nadu. For some curse to Sri Lanka they have born in our country. Jaffna king Sakkili was a HINDU. ALL elected TNA buggers are HINDU except one who is a Buddhist. The KEY WORD here is TAMIL. No matter what Tamil they are they are DAMN-ILL-S.
Tamils in Sri Lanka are NOT all that prudent or bright to see what is happening in other countries. Even if they see it, they want to pretend not to see and want a Christian dominated state, just to see if that will work. THERE are no trial & error procss in deciding their future. THEY ALREADY have a country called TAMIL NADU, and what more do they want?. Try living with limited freedom, limited language rights ( a population such small) no equal status & learn to live with Sinhalese, BY LEARNING SINHALESE. Some Tamils are buddhists & spread buddim in parts of North & East, as this is the ONLY SALVATION for Tamils. If that is not possible, SETTLE in Tamil Ndu as TN is their big brother. I have not seen a SINGLE TAMIL speak against INDIAN encroachment & fishing in Lankan waters. WHY ARE THEY NOT concerned about poor Tamil fishermen who languish in Indian prisons. Not a single politician in NORTH & EAST has ever uttered a WORD denouing Indian intervention in Sri Lanka fishing areas. This is the hypocracy like the western countries THEY KEEP MUM, and blame it all on GOSL. That is why I beleive they should emigrate in large numbers to TN, not to Europe or North America. South Sudan has oil attraction but Tamil Elam has only Tamil war widows for an attraction to white masters. Another side to this story is that sudan had oil and China was developing those oil fields. Oil had to go through the North and Only the South had Oil. So, they created two countries. You got one thing wrong. Tamil Racists will NEVER LEARN. If they learn will they vote for the TNA? What has the TNA done for them? What has the LTTE done for them? besides destroying many Tamil lives nothing. What has the Tamil Diaspora ever done? Have they used their money to build one school one hospital, one toilet? NO. But they are so ready buy weapons and go for war!! That is what makes them complete vermin to Sri Lankan soil. All over the world Sri Lankan Tamils Built Hindu Temples for maintaining the same system of life in Sri Lanka. Even They use the Churches tin western countries hey organise to continue with Tamil Priesters from Sri Lanka. There are no different in between Hindus and Catholics Tamils. All of them have same mentality. AS WEAPON FOR THEIR OWN WEALTHY LIFE. Good. This is a resource we should make use of to fight poverty. MOST housemaids newly exported now are from the north and east. There is a bigger problem in Africa. SOUTH PART of Africa is Christian. NORTH PART of Africa is Muslim. Islam is spreading SOUTHWARDS. Sudan, Nigeria, now Kenya, etc. are on the Christian-Muslim border. This is a last ditch attempt by Christian west to SAVE Africa from Islam. A similar thing may be done to Nigeria. China also supported the split of Sudan and so did Christian Russia. MOST housemaids newly exported now are from the north and east.- Agreed, because South & West not useful any more for Arabic ? ! re Immigration & Emigration. This Nation is a ‘sitting duck’ in the region because of our lax Laws. In this context, the SAARC liberal rules where SAARC member country citizens can enter Sri Lanka and claim refuge/Asylum is dangerous to Sri Lanka. Though the SAARC rules demand that Separatism is contravening the Laws of SAARC, various groups within Lanka break Lanka’s own 6th Amendment which forbids Separatism and get away with it too (proven by ltte, TNA, the Muslim/Tamil political party etc.). Member countries of SAARC consist of Bangladesh, Bhutan, India, Maldives, Nepal, Pakistan, Afghanistan & Sri Lanka. During the time of CBK/Ranil rule, hundreds of thousands of Tamil illegal migrants entered Sri Lanka. Otherwise, how else can we account for the same number of Tamil folk now, even after One Million left Lanka as Refugees after 1983 trumped up Riots. This illegal entry was done mainly via the Mannar Route (Rev Reyappu Joseph will know a lot about this matter). Newcomer Tamils come with the negative psychological baggage of Caste/poverty problems and are pawns to ‘big games’ going on in Sri Lanka for Separatism/Balkanisation. From the Muslim side, more recently, many thousands of Maldivians have entered Lanka. Now Pakistanis are coming into Lanka (see article below). Can Lanka, a small country, accommodate all these people at taxpayer costs ? The local indigenous folk keep complaining about the cost of living etc. and going on strike with constant unrest, with CKDu disease matters yet unresolved, Sri Lanka govt. is playing permanent host to various people from the SAARC countries at taxpayer cost ! This does not make any sense. In fact, it is a recipe for disaster after disaster, leading in the end to Separatism. India does not allow the SAARC people to enter India without a prior visa, whereas Lanka allows visa on arrival. After entering Sri Lanka easily, these people claim Refugee status/Asylum, and stay on. After that they are pawns in the hands of Separatists. How long can Lanka accommodate such arrivals, particularly when GoSL is cornered with HR violations etc and the 6-A is not even activated ? Note that ALL the SAARC countries are poor, very poor, and some such as the Maldives have religious rigidity (cannot take any religious books or ornaments, statues there, other than Islamic ones). And who wants to settle down in Afghanistan ?? Sri Lanka seems very ‘Liberal, accommodative & green’ compared to other SAARC countries which are mostly overpopulated (no birth control at all in some). As such they will seek greener pastures. Lanka is the regional sitting duck to target because of lax laws to protect her own territory ! Whilst I sympathize the the plight of these people from SAARC countries, Sri Lanka is not the place to seek refuge as this nation is already beleaguered and troubled, and appears unable to take care of the needs of the local people. Desirous of promoting peace, stability, amity and progress in the region through strict adherence to the principles of the UNITED NATIONS CHARTER and NON-ALIGNMENT, particularly respect for the principles of sovereign equality, territorial integrity, national independence, non-use of force and non-interference in the internal affairs of other States and peaceful settlement of all disputes. Conscious that in an increasingly interdependent world, the objectives of peace, freedom, social justice and economic prosperity are best achieved in the SOUTH ASIAN region by fostering mutual understanding, good neighbourly relations and meaningful co-operation among the Member States which are bound by ties of history and culture. Aware of the common problems, interests and aspirations of the peoples of SOUTH ASIA and the need for joint action and enhanced co-operation within their respective political and economic systems and cultural traditions. Convinced that regional co-operation among the countries of SOUTH ASIA is mutually beneficial, desirable and necessary for promoting the welfare and improving the quality of life of the peoples of the region. Convinced further that economic, social and technical co-operation among the countries of SOUTH ASIA would contribute significantly to national and collective self-reliance. Recognising that increased co-operation, contacts and exchanges among the countries of the region will contribute to the promotion of friendship and understanding among their peoples. Recalling the DECLARATION signed by their Foreign Ministers in NEW DELHI on 2 August 1983 and noting the progress achieved in regional co-operation. Reaffirming their determination to promote such co-operation within an institutional framework. to co-operate with international and regional organisations with similar aims and purposes. All bilateral issues to be kept aside and only multilateral(involving many countries) issues to be discussed without being prejudiced by bilateral issues. Tue, Jan 7, 2014, 01:22 pm SL Time, ColomboPage News Desk, Sri Lanka. Jan 07 (SBS) In recent years, Sri Lanka has been one of the main sources of asylum seekers arriving in Australia. But mainly Buddhist Sri Lanka has its own asylum seeker issue – with an increasing number of Pakistani Christians arriving to claim refugee status. Catholic Church leaders say Sri Lanka is now hosting more than 600 asylum seekers claiming to be victims of persecution of the minority Christian community in Muslim-majority Pakistan. The Pakistanis are not eligible to work, and are relying on support from Sri Lankan Christians. Catholic Church spokesman in Colombo, Father Xystus Kurukulasuriya, spoke to Zara Zaher. read as : ” Lanka is the regional sitting duck to target because of lax laws, and unable to protect her own territory !”. If new maids to Middle East are from N&E, it is because they are Muslims and better able to blend into Muslim countries. This entry was posted on Saturday, January 4th, 2014. You can follow any responses to this entry through the RSS 2.0 feed. You can skip to the end and leave a response.